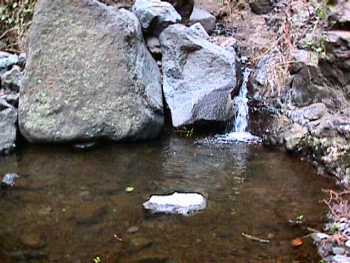 A barranco is a dry riverbed. 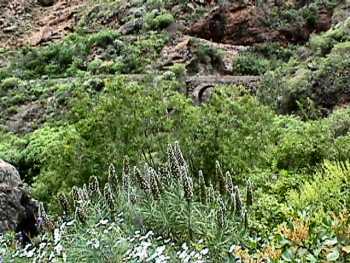 All the rivers on Tenerife are diverted into canals. 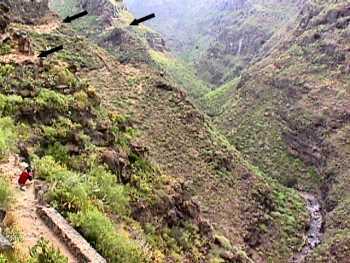 The black arrows show the trail along the side of the canyon. 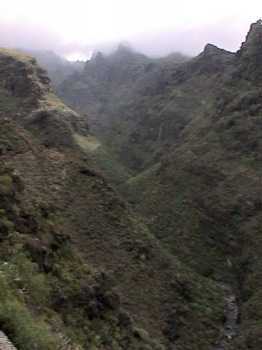 It does not rain often on Tenerife but the tops of the canyons are often in the clouds and the water forms as droplets on the trees and plants. The trail goes over the bridge. Above it is the canal which carries the water down to the irrigation systems. The canals are being replaced by pipes. Looking to the top of the canyon, high in the clouds. After a few kilometers the trail is beside the streambed - still no water to be seen in the stream, only in the canal. Finally we reached the spot where the water is diverted from the stream into the canal. From here on there was lots of water in the stream. The rocks here are really blue. 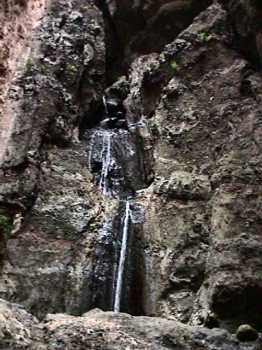 Our goal is in sight - the waterfall at the head of the barranco. 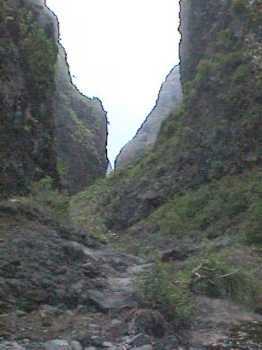 The canyon is very narrow at the waterfall and it is very difficult to get a good photo. This is two photos put together.